Writer and film-maker Sheila Hayman works with torture survivors, work that is often life-affirming – like her choice of painting at the National Gallery. The writer and filmmaker Sheila Hayman runs writing workshops for survivors of torture, and when she set about choosing a painting for her Essay at the National Gallery, she thought she would be drawn to an image of physical torment. 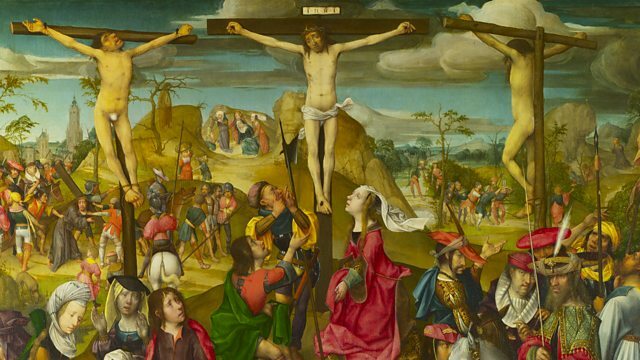 But the image that attracted her was the 16th-century Crucifixion by the Master of Delft in the Netherlands. Telling the entire story from Christ’s trial to his resurrection, and bursting with colour, detail and busyness, the painting still shows the suffering of Christ – but all around him, life goes on. Ultimately, Sheila concludes, it speaks of resurrection rather than death, as do the stories of those torture survivors – and her own Jewish refugee father. Image © National Gallery by kind permission.